The king is dead, long live the king! NBA has a new champion. San Antonio avoid a new trauma ending the NBA final series in Game 5 played that night at the AT & T Center. In the same vein of their trip to Florida, the Spurs have thrashed the Miami Heat, 104-84, with Kawhi Leonard (22 points, 10 rebounds) named MVP of the Finals. However, things had started badly for the Texans. Decided to change the course of history, LeBron James (31 points, 10 rebounds, 5 assists and 2 blocks) takes his responsibilities and in his wake, the Heat showered a 6-22 on the men of Gregg Popovich at the start of the meeting-including 12 points, 4 rebounds and 2 blocks by King James. San Antonio gave way first to the Floridan heat before getting back into the game, 22-29 after the first quarter time. Double champions take thereafter foot in the floor with a 17-6 sounding Texan revolt. Spurs snatched the lead at the break, 47-40. Spurs collectiveness is marveling. Heat proved awkward as they registered only 5 points in 11 minutes. Spurs seize the opportunity to increase the gap to over 19 at the start of the last act (77-59). 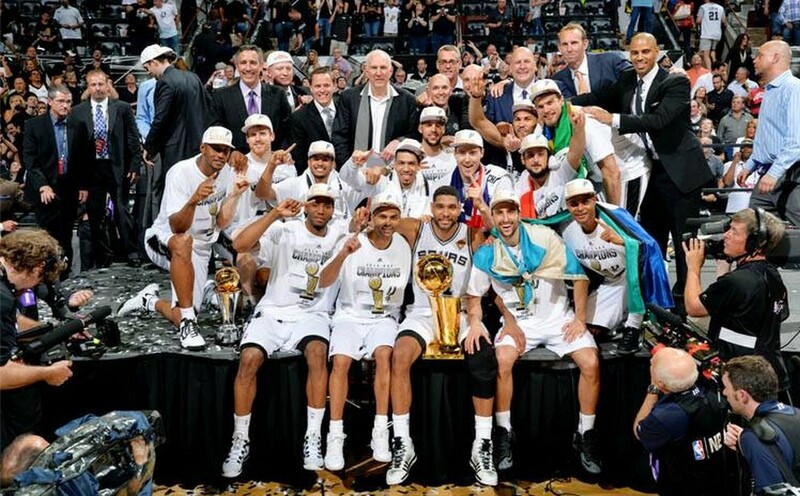 San Antonio manages the end of the game and wins the fifth title in their history: 1999, 2003, 2005, 2007 and 2014. Tim Duncan, who part of in all these campaigns ended with 19 points and 4 assists… This is the fourth title for his two other accomplices of the Big Three Manu Ginobili (17 points) and Tony Parker (18 points). TP joined the circle of NBA players to have won 4 rings and a MVP of the Finals. NBA first ring for Boris Diaw (5 pts, 9 rebounds, 6 wt) who will now take head for the 2014 Fiba World Cup with the Blues.